Designed for every type of riding, this stylish bag comes in standard or wide base versions to fit virtually any style of bike with its included quick-release mounting system that lets you remove and install the bag in seconds. The bag's large main compartment opens a full 18 Degree and is spacious enough for a laptop computer and has a tech-organizer for smart-phones, digital cameras, or MP3 players. Three internal pockets and three big exterior pockets allow easy access when on the go; two of the exterior pockets expand an additional 2" for extra storage. Rugged 12-denier Saddle Tuff, semi-rigid, construction is water-resistant with an integrated rain cover. Thirteen exterior D-rings for attaching other items like jacket or other luggage (six concealed D-rings to prevent scratching). Comfortable carry handle allows the bag to be used as a suitcase when off the bike. 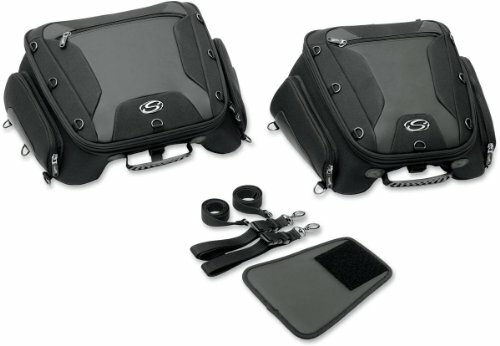 STANDARD MODEL fits bikes with a 9" W or smaller rear seat/pillion like a Suzuki GSX-R6/75, a Yamaha R1 or a Dual Sport motorcycle; the base's tunnel dimensions are 9" W in front and tapers down to 6" W in rear x 3" D x 15" L. The bag's exterior dimensions are 15" L x 17.5" W x 11" H. WIDE MODEL fits bikes with a 12" W or smaller rear seat/pillion like a Suzuki Hayabusa, a Honda Shadow or a Yamaha FZ1; the base's tunnel dimensions are 12" W in front and tapers down to 9" W in rear x 3" D x 15" L; exterior dimensions are 15" L x 21" W x 11" H.
If you have any questions about this product by Saddlemen, contact us by completing and submitting the form below. If you are looking for a specif part number, please include it with your message.